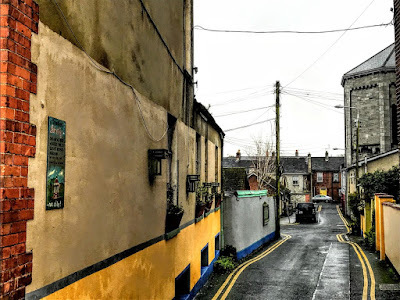 The area behind Barrington Street and Saint Joseph’s Street in Limerick is a colourful mixture of side streets and laneways where a colourful splash of paint can be a surprising delight to come across but also illustrate the civic pride to be found in this corner of Limerick. Before Georgian Limerick was developed, this was an open area with green fields. But it was transformed by the development of Newtown Pery in the Georgian era at the end of the 18th and the beginning of the 19th century. The streets and laneways around Barrington Street were first laid out in the 1830s and the 1840s. The laneways served the streets, allowing access to the coach houses, stables and kitchens behind the houses. At one time, an observatory stood behind one of the houses on Little Barrington Street. This can be seen on maps from around 1850, but it was later replaced by a scout hall, and in time it became the premises of John Raleigh, a builder, plumber and sanitary engineer. In time, a number of artisan dwellings were also built along these laneways, so that by 1840 there 32 cottages in the area around Little Barrington Street, Schoolhouse Lane and Carrol’s Row, behind Barrington Street and Richmond Street. These were mainly single-storey houses, with two or three small rooms and tiny outdoor yards, sometimes with up to 10 people living in each house. The 1901 census shows that 200 people were living in these 32 cottages. The names of Little Barrington Street and Schoolhouse Lane have been used interchangeably over the years, and the lines of these two small streets have changed with the changing times. Schoolhouse Lane led to the rear gate of an old school that stood on Richmond Street, now Saint Joseph’s Street. The laneway does not exist anymore, and the houses that lined it were demolished in the 1970s, but it stood behind the rear entrance to Saint Joseph’s Church. Carrol’s Row takes its name from Martin Carroll, a Limerick builder and developer, who built and developed 16 houses on Carroll’s Row and four houses on Richmond Street, now known as Saint Joseph’s Street. Little Barrington Street is the original name given to the laneway running behind the houses on Barrington Street. It takes its name from the Barrington family, who were involved in much of the Georgian development of Limerick, and who also gave their name to Barrington’s Hospital. By the 1930s, the site of the former observatory at the end of Little Barrington Street was the premises of John Duggan, glazier and glass merchant. The business had been established in Nelson Street (Parnell Street) in the 1870s, and moved to Roche’s Street in the 1950s. Later, the premises were used as a workshop by Ter Bussoli, originally from Italy, who manufactured statues and religious goods. Ter Bussoli’s workshop and the 32 cottages in this area were demolished by Limerick Corporation in the 1970s, and the cramped and overcrowded conditions came to an end in this part of Limerick after 130 years. 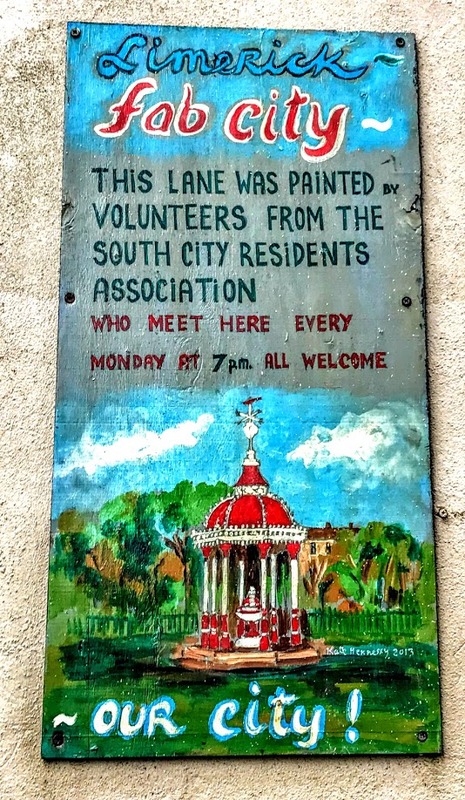 In recent years, the lane has been repainted by members of the South City Residents’ Association, showing civic pride and pride of place are still alive in this part of Limerick.